Stage 2 subdivision works are closing in on completion in conjunction with wetland construction. Civil works are currently programmed for completion in mid-late August with compliance and title registration to be completed immediately following. 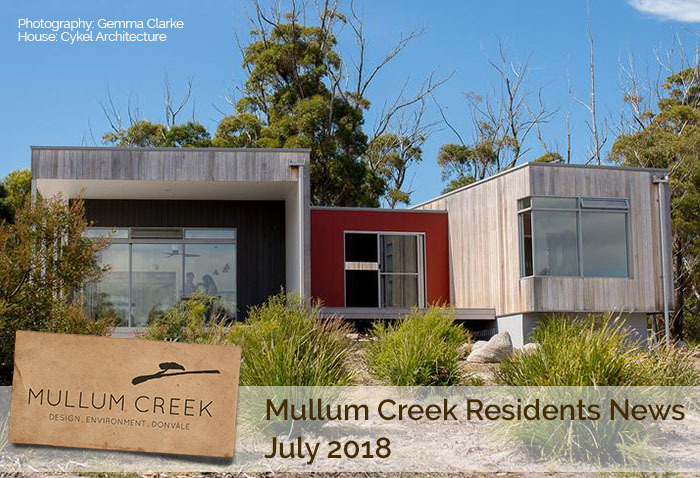 Vince Strangio is the builder for Wes and Davina Bate on Lot 42 at Mullum Creek. Holly Gurling recently interviewed him. I met with Vince on a sunny day in June. We had a chat on two large boulders near the wetland at Mullum Creek – it’s hard to find table and chairs on a building site! Vince’s team has worked on a number of ecologically sensitive, 7-star energy rated builds. He believes that more people should be moving in this direction…. Feature Article: The EVs are coming! The EVs are coming! But is your home EV-ready? From Renew magazine Issue 143 by the Alternative Technology Association. Electrical contractor, EV charging point installer and EV owner Bryce Gaton looks at what you need to know to assess the potential hidden installation costs and practical considerations in preparing your home for an EV. Open House Melbourne – held in July every year – is much more than the chance to stickybeak at some of Melbourne’s most fascinating buildings (although that’s a pretty huge drawcard, to be honest). It’s also an opportunity to reflect on the role that design has played in the evolution of our city, to glimpse what Melbourne may become in the future, and to consider the significance of our heritage and what we can do to protect it.